1دانشجوی کارشناسی ارشد، مهندسی آبیاری و زهکشی، دانشگاه فردوسی مشهد. 2استاد گروه مهندسی آب، دانشکده کشاورزی، دانشگاه فردوسی مشهد. در بین محصولات کشاورزی، زعفران (Crocus sativus L.) ازجمله ارزشمند‌ترین محصولاتی است که با توجه به ویژگی‌های خاص خود، امکان گسترش تولید و صادرات آن وجود دارد. در بیشتر مناطق کشور به علت نیاز آبی کم این محصول و سازگاری مناسب آن با شرایط محیطی، امکان کشت این گیاه وجود دارد. لذا در سال ‌های اخیر سطح زیر کشت زعفران به‌ خصوص در استان خراسان رضوی افزایش‌یافته است. در پژوهش حاضر آﻣﺎر و اﻃﻼﻋﺎت ماهیانه‌ درجه حرارت حداقل، درجه حرارت متوسط، درجه حرارت حداکثر و نیز اختلاف درجه حرارت شبانه‌روز در شهرستان ‌های دارای کشت زعفران در استان خراسان‌ رضوی در یک دوره 20 ساله به همراه ﻋﻤﻠﻜﺮد زﻋﻔـﺮان در این دوره، جمع ‌آوری و با استفاده از نرم‌افزار SPSS معادلات رگرسیون برآورد گردید. سپس با استفاده از معادلات به‌دست‌آمده و نرم‌افزار ArcGIS به پهنه‌بندی مناطق مستعد کشت زعفران پرداخته شد. نتایج نشان داد عملکرد زعفران به‌شدت تحت تأثیر درجه حرارت بوده، اما این تأثیر بسته به اقلیم هر منطقه متفاوت است. همچنین بررسی نقشـه‌های پهنه‌بندی ایجادشده بر اساس معادلات رگرسیونی ایجاد شده نشان داد که مناطق جنوبی استان ازجمله بخش هایی از شهرستان گناباد دارای بهترین موقعیت از لحاظ پارامترهای مورد بررسی برای کشت زعفران بوده (عملکرد 4/88-4/21 کیلوگرم در هکتار) و این عملکرد از جنوب به سمت نواحی شمالی استان روندی کاهشی داشت؛ به ‌طوری‌که شهرستان‌ های مرکزی استان مانند تربت ‌حیدریه، کاشمر و خواف دارای عملکرد متوسط (4/21-3/53 کیلوگرم در هکتار) و شهرستان ‌های شمالی مانند قوچان دارای عملکرد نسبتاً ضعیف (3/53-2/85 کیلوگرم در هکتار) و تقریباً معادل نصف مناطق جنوبی استان بود. همچنین مطابقت این نقشه ‌ها با نقشه پهنه ‌بندی عملکرد واقعی زعفران همبستگی بالای عملکرد زعفران با عوامل اقلیمی، به‌ خصوص پارامترهای دمایی را نشان داد. 1M.Sc. student of Irrigation and Reclamation Engineering, Ferdowsi University of Mashhad. 2Professor of Water Engineering, Faculty of Agriculture, Ferdowsi University of Mashhad, Iran. 3Associate Professor of Water Engineering, Faculty of Agriculture, Ferdowsi University of Mashhad, Iran. 4Professor of Agronomy, Faculty of Agriculture, Ferdowsi University of Mashhad. Saffron is cultivated in most part of Iran, because of low water requirement and well adaptation to diverse environmental condition. In recent years, for many reasons such as low water requirement, saffron cultivation areas has been increased especially in Khorasan Razavi province. Temperature is one of the most important factors in saffron flowering phenomena. The aim of this research was to evaluate the response of saffron to temperature in Khorasan Razavi province counties (Torbat-e-Heydarieh, Gonabad, Nishabour, Sabzevar and Ghoochan). Climatic data (monthly minimum, average, maximum temperatures and diurnal temperature range) and saffron yield data were collected for past 20 years period. The stepwise regression methods were used to remove extra parameters and only keep the most important ones. By using these equations and ArcGIS software zoning, Spline method was find the best for saffron crop zoning. The results of linear regression in Gonabad showed that minimum, maximum and average temperature and also diurnal temperature range in March and April months had the greatest impact on saffron yield. For each of the four indices (the minimum, maximum and average temperature and also diurnal temperature range) the best area for saffron cultivation was the southern part of the province (particularly Gonabad); so by increasing distance from this area to north areas (such as Kashmar, Torbat-e-Heydarieh, Sabzevar, Nishabour, Mashhad and finally Ghoochan) saffron yield reduced by 30 to 50 percent. Therefore, the northern areas of the province had relatively low saffron yield. According to result of this research, saffron yield in Khorasan Razavi province was significantly influenced by temperature parameters. Flowering which basically is the most important stage of plant growth, is directly setting up with temperature. Alavi Zadeh, S.A.M., Monazzam Esmaeel Pour, A., and Hossein Zadeh Kermani, M. 2013. Possibility study of areas with potential cultivation of saffron in Kashmar plain using GIS. Saffron Agronomy and Technology 1 (1): 71-95. (In Persian with English Summary). Alizadeh, A., Sayari, N., Ahmadian, J., and Mohamadian, A. 2009. Study for zoning the most appropriate time of irrigation of saffron (Crocus Sativus L.) in Khorasan Razavi, North and Southern provinces. Journal of Water and Soil 23 (1): 109-118. ArcGIS 2005. ArcGIS version 9.1. Esri Institute, New York, USA. Atkinson, D., and Porter, J.R. 1996. Temperature, plant development and crop yields. Trends in Plant Sciences 1 (4): 119-124. Benschop, M. 1993. Crocus. In A. De Hertogh, and M. Le Nard. The physiology of flower bulbs. Elsevier Science Publishers, Amsterdam, The Netherlands. p. 257–272. Ellis, R.H., Hadley, P., Roberts, E.H., and Summerfield, R.J. 1990. Quantitative relations between temperature, crop development and growth. In M.T. Jackson, B.V. Ford-Lloyd and M.L. Parry (Eds.). Climate change and plant genetic resources. Belhaven Press, London, UK. p. 85-115. Esmaili, R., Montazeri, M., Esmaeelnejad, M., and Saber Haghighat, A. 2012. Climatic regionalization using multivariate statistical methods, case study: Khorasan Razavi Province. Journal of Climate Research 7-8: 43-56. (In Persian with English Summary). Fallah Ghalhary, G.A., Habibi Nokhandan, M., and Khoashhal, J. 2008. Spring rainfall estimation of Khorasan Razavi province based on tele-connection synoptically patterns using adaptive neuro-Fuzzy inference system 63 (1): 55-74. Faraj Zadeh, M., and Teklobighash, A. 2001. The agroclimatic distribution of Hamedan province by using geographical information system, Geographical Research Journal 14: 63-105. (In Persian with English Summary). Filabi, A. 2012. New Technology in Saffron Production, challenges and approaches. Sixth National Saffron Festival, Ghaen. (In Persian with English Summary). Halevy, A.H. 1990. Recent advances in control of flowering and growth habit of geophytes. Acta Horticulture 266: 35-42. Hartkamp, A.D., De Beurs, K., Stein, A., and White, J.W. 1999. Interpolation techniques for climate variables. CIMMYT NRG-GIS Series, Mexico. Hosseini, M., Mollafilabi, A., and Nassiri, M. 2008. Spatial and temporal patterns in Saffron (Crocus sativus L.) yield of Khorasan province and their relationship with long term weather variation. Journal of Iranian Field Crop Research 6 (1): 79-88. Kafi, M., Rashed, M.H. Koocheki, A., and Mollafilabi, A. 2002. Saffron (Crocus sativusL. ), production and processing. Center of excellence for agronomy, Faculty of Agriculture, Ferdowsi University of Mashhad, Iran. Kamyabi, S., Habibi Nokhandan, M., and Rouhi, A. 2014. 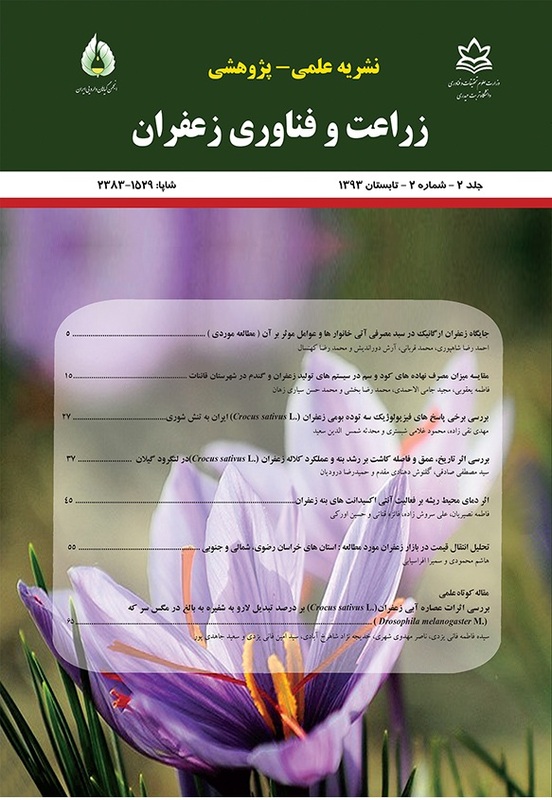 Effect of climatic factors affecting saffron using analytic hierarchy process (AHP); (Case Study Roshtkhar Region, Iran). Saffron Agronomy and Technology 2 (1): 75-90. (In Persian with English Summary). Koocheki, A., Nassiri, M., Alizadeh, A., and Ganjali, A. 2009. Modelling the impact of climate change on flowering behavior of Saffron (Crocus sativus L.). Iranian Journal of Field Crops Research 7 (2): 592-594. (In Persian with English Summary). Koul, K.K., and Farooq, S. 1984. Growth and differentiation in the shoot apical meristem of the saffron plant (Crocus sativus L.). Journal of Indian Botanical Society 63: 153–160. Koozehgaran, S., Mousavi Baygi, M., Sanaeinejad, H., and Behdani, M.A. 2011. Study of the minimum, average and maximum temperature in South Khorasan to identify relevant areas for saffron cultivation using GIS. Soil and Water 25 (4): 892-904. (In Persian with English Summary). Koozehgaran, S., Mousavi Baygi, M., Sanaeinejad, H., and Behdani, M.A. 2014. Identification relevant areas for saffron cultivation according to precipitation and relative humidity in South Khorasan using GIS. Journal of saffron research 1 (1): 85-96. (In Persian with English Summary). Moafi Madani, S.F., Mousavi Baygi, M., and Ansari, H. 2013. Prediction of drought in the Khorasan Razavi province during 2011-2030 by using Statistical Downscaling of HADCM3 Model Output. Geography and Environmental Hazard 1: 21-37. (In Persian with English Summary). Moayedi Shahraki, E., Jami Al-Ahmadi, M., and Behdani, M.A. 2010. Study of energy efficiency of saffron (Crocus sativus L.) in Southern Khorasan. Agroecology 2: 55–62. (In Persian with English Summary). Mohammadi, H., Ranjbar, F., and Soltani, M. 2011. Climatic potentials assessment for saffron cultivation in Marvdasht. Journal of Geography and Environmental Planning 22 (3): 143-154. (In Persian with English summary). Molina, R.V., Garcıa-Luis, A., Coll, V., Ferrer, C., and Valero, M. 2004. Flower formation in the saffron Crocus (Crocus sativus L.), the role of temperature. Acta Horticulturae 650: 39–47. Molina, R.V., Valero, M., Navarro, Y., Guardiola, J.L., and Garcia-Luice, A. 2005. Temperature effects on flower formation in saffron (Crocus sativus L.). Scientia Horticulturae 103: 361–379. Sadeghi, B. 2012. Effect of corm weight on saffron flowering. In Proceedings of the 4th International Symposium on Saffron Biology and Biotechnology. Kashmir, India, 22-25 October 2012. SPSS 2013. SPSS Version 22. IBM Institute, Chicago, USA. Tait, A., Henderson, R., Turner, R., and Zheng, X. 2006. Thin-plate smoothing spline interpolation of daily rainfall for New Zealand using a climatological rainfall surface. International Journal of Climatology 26 (14): 2097–2115.